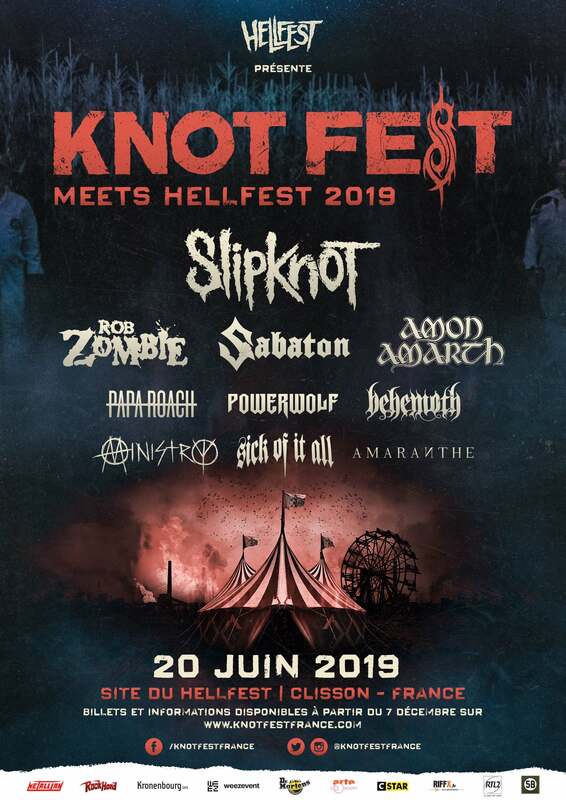 Exclusively in 2019, we are happy to announce that on Thursday, June 20, HELLFEST will welcome our friends from the KNOTFEST festival. We hope with all our hearts that the bands on this special day will live up to your expectations: SLIPKNOT – ROB ZOMBIE – PAPA ROACH – MINISTRY – SICK OF IT ALL – SABATON – AMON AMARTH – POWERWOLF – BEHEMOTH – AMARANTH. As you know, owners of 3-day passes are more likely to come on Thursday in Clisson. Delighted by these 10 exceptional names, HELLFEST has agreed to lend its Main Stages to allow its fans already present to enjoy another mini-festival and additional programming. Best of all, we hope that this bonus initiative will make you happy and that you will keep enough energy to follow the 3 Days of HELLFEST. For those interested, note that the special KNOTFEST Festival passes will be on sale online at € 66.60 on a dedicated ticket office on December 7th at 2 pm! No need to remind you that the capacity in front of our Main Trainees is limited and the speed of sales may be similar to that of Hellfest. As part of the KNOTFEST, be aware that all additional logistical information, reception, control, and operation will be communicated later. ALL HOPE IS NOT GONE & SEE YOU IN HELL!